Countless modern pedals and plugins strive to replicate the unique and classic sounds of analog tape delays, and many do a fantastic job. But the subtle idiosyncrasies of tape, magnets, and reels add up to an organic sound that can never quite be replicated by modern technology. Time-honored units like Echoplexes, Echorecs, and Space Echos are treasured for a reason. They were used by the who's who of tone titans, and even if you are able to find one you can afford, many units will require costly repairs to maintain. Luckily, there’s an easy, inexpensive way to get authentic tape tone into your rig. There are countless old reel-to-reel machines out there that are past their prime, just waiting to be given new life as gritty, spacey delay effects. Every model will have its own unique layout and controls, but the operating principles are universal. 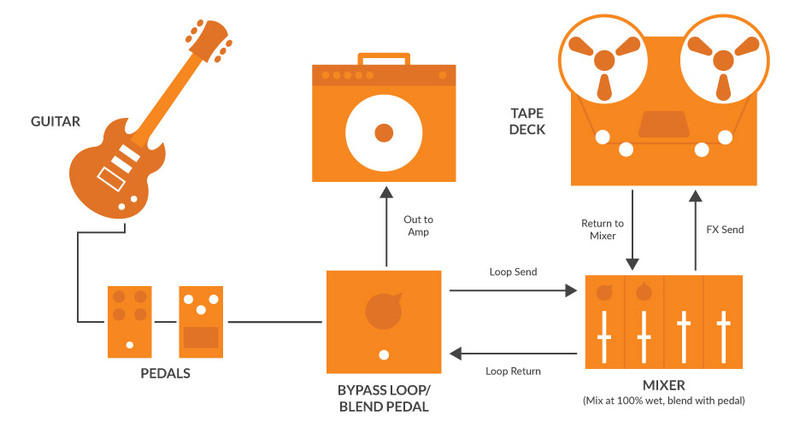 This primer will get you up to speed on the theory behind tape delay and walk you through a few basic setups you can use to dive into the trippy world of analog tape delay with confidence. First, the erase head clears the tape before it gets to the record head (when armed). Don’t worry about this one, though, because all of the magic happens between the next two heads. 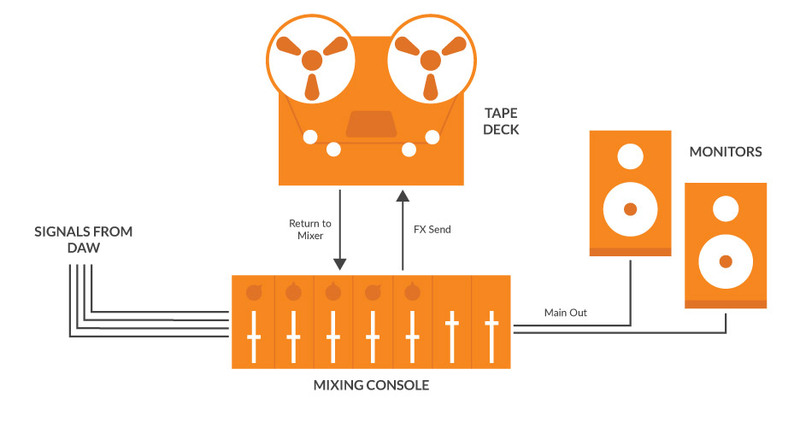 The record (or "sync”) head not only records the input signal but can also play back what’s already on the tape at the same time, enabling real-time overdubbing. Lastly, a dedicated playback head can be engaged to pick up what’s on the tape with greater fidelity, usually for final mixdown. For the delay effect to work, you must always have the playback head selected for monitoring. If you monitor from the record/sync head, you won't hear any delay. The time between repeats is controlled by varying the tape speed, so a fine-tunable speed control is essential (often labeled pitch or varispeed). A high/low speed switch will give you an even greater range of delay times. Feedback is achieved by sending the delayed signal back into the machine to be recorded again and again and again. By controlling the amount of signal sent back to tape, you can get anything from single-repeat slapback to extreme self-oscillation. Most importantly, you’ll need a tape recorder with all three heads as mentioned above, as well as a pitch/varispeed control. Some cassette decks will work, as will a recorder/mixer combo like the Tascam 388. But the ideal candidate is an inexpensive two-track reel-to-reel machine. Units with four, eight, or more tracks can be used, but more tracks does not mean more discrete delays. Everything being sent to the effect will have the same delay time, but you will retain control over feedback, EQ, and panning of each output. Some flaws are acceptable. This is for an effect, after all, not for actual recording. That said, a working transport system is essential. Make sure the play, record, stop, fast-forward, and rewind all function and that the motors don't squeak or grind. Often, a sluggish or non-playing machine just needs a new motor belt and a good cleaning, but try to avoid a unit that needs a lot of fixes. Of course, you'll also need a few supplies to get started — most importantly, the tape itself. Common tape sizes for consumer formats are ¼-inch and ½-inch, which usually come on metal or plastic 7-inch or 10.5-inch reels that mount onto simple metal spindles or locking plastic hubs (depending on the machine). Some decks will require smaller reels or different types of tape, so be sure to read the manual or look it up online. While free tapes included with a machine may be tempting, they’re often badly degraded, shedding particles of iron that’ll gunk up your machine. Luckily, you'll only need one reel of new tape and one empty "takeup” reel. Don't get too caught up in the myriad of tape formulations available. A common modern tape like RMGI SM911 will do fine for this application. Other essentials include machine oil for lubrication, pure alcohol for cleaning the tape path, and plenty of cotton swabs. You can also invest in a handheld demagnetizer for erasing magnetic buildup, calibration tapes, and an oscilloscope, but only the basics are necessary to start making sounds. There are two principal ways to use your tape delay: in series as a real-time performance effect that’s fed by your instrument and mixed into your signal chain or in parallel as a mixing effect, sending pre-recorded sounds to it and recording the output. To use your tape delay as a real-time effect that you play or sing into directly, you'll need a way to blend the effect with your dry signal, as well as control feedback. If you just plugged straight into a tape deck, you'd only hear the delayed signal (and only one repeat). A compact mixer is an easy way to get started, but once you get the hang of it, the whole setup can be connected to an amplifier’s effects loop or a blend pedal to give you pedalboard access to your tape delay. 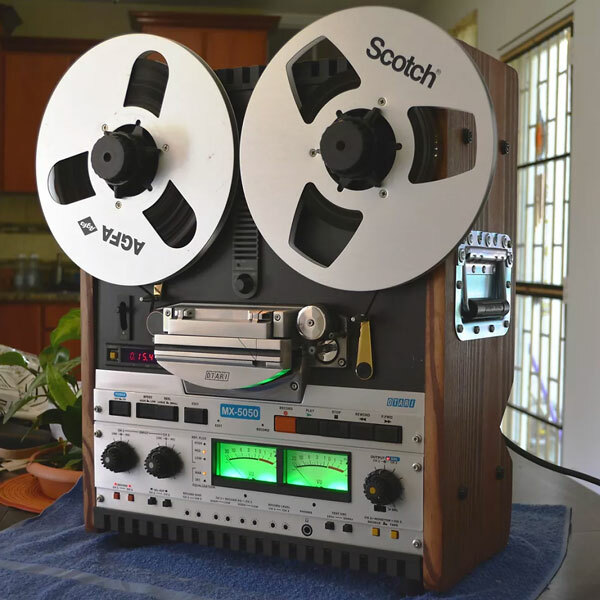 If you're working "in the box,” integrating your tape delay with a DAW, route the desired signal(s) to a spare output on your audio interface (such as an aux or headphone output) and connect that to the tape input. 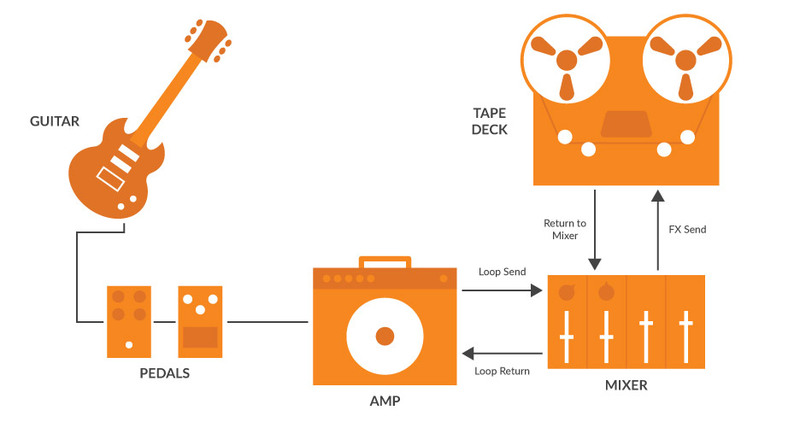 Feed the tape output into a line input or preamp to monitor and record the effect. 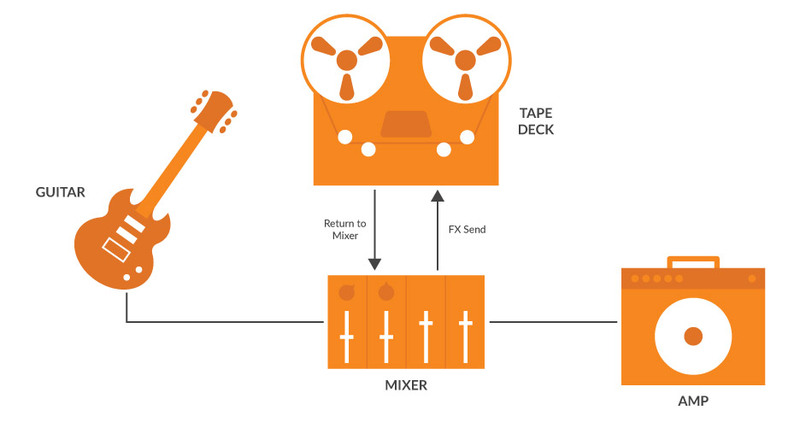 Feedback can be controlled by routing the delayed signal back to the output feeding the tape. When mixing on a console, feed the tape input with an effect send, and bring the output back onto a spare channel (not an effect return — you won't be able to create feedback this way). Use the effect send knob on any channel to send sounds to the delay. To increase feedback, send the delayed signal back to tape with the effects send on the channel you returned the delay to. Depending on the source (guitar, keyboard, microphone, or mixer) and the inputs on the machine (1/4”, RCA, or XLR), you may need some adapters to get from A to B. You can use direct boxes or reamp boxes to get the proper level and impedance to and from the machine, but it's not necessary to have fun. In fact, improper impedance and levels can add some unique distortion and noise. When you have everything hooked up, clean the tape path and feed the tape from the left reel through the rollers, across the heads, and onto the takeup reel on the right. Set the speed and feedback controls as desired, arm your track(s), and press record. Remember that the tape will reach its end eventually, so always start at the beginning to ensure maximum runtime. Especially with smaller reels at high speed, it's important to make sure it doesn’t run out in the middle of a song. Dial in moderate feedback and use the speed control to match the tempo of a song for a traditional, spacey echo. With a single repeat (no feedback), set tape speed to high and crank the pitch/varispeed control all the way up for the classic slapback sound heard on country and rockabilly records. Crank up the input gain to add a saturated, truly analog distortion to your delay. Find the sweet spot which produces infinite repeats, then use a volume pedal to create swelling ambient soundscape. When you reach the end, you’ve now got a Frippertronics-style tape of your masterpiece. Manually manipulate the reels and the tape itself for some truly organic effects a pedal could never give you. To get truly weird, try moving a magnet close to the record head (do this away from hard drives or other tapes).